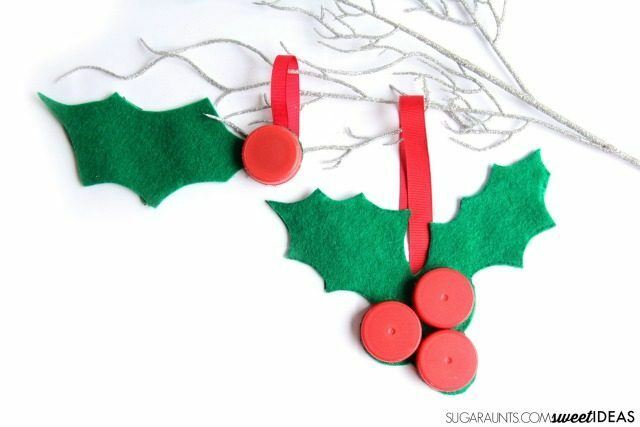 Making Christmas decorations with kids is a fun way to begin celebrating for the holidays. Kids’ ornaments just add that extra something to the Christmas tree, don’t you think? 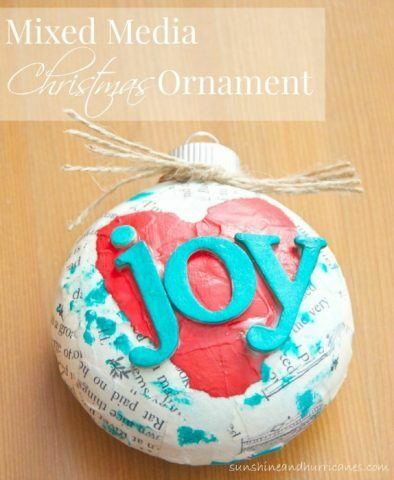 If you have a variety of recyclables at home, be sure to try some of these wonderful recycled Christmas ornaments. 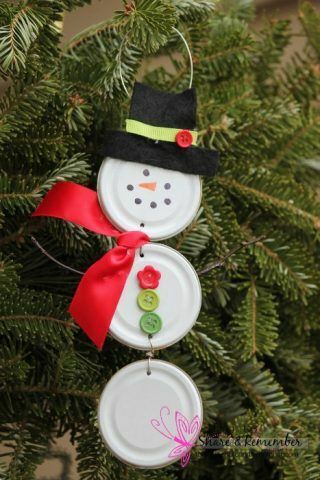 This Recycled Can Lid Snowman Ornament from Things to Share and Remember will look amazing on the tree. 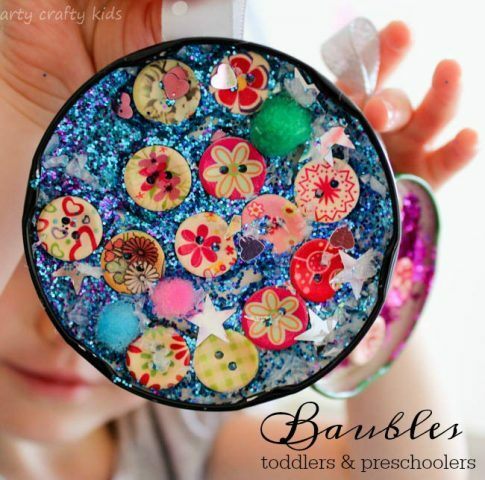 Jar Lid Baubles from Arty Crafty Kids are so sparkly and fun! Teaching 2 and 3 Year Old’s Simple Plastic Lid Ornaments are perfect for toddlers to make. Use clean cleans and photos (or old Christmas cards) to make Recycled Lid Ornaments like No Time for Flash Cards. 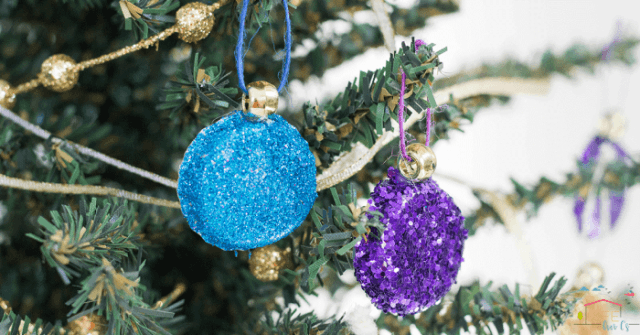 Frogs and Snails and Puppy Dog Tails’ Plastic Lid and Sequins Ornament are simple and fun for the kids to make. Kids who love tape will definitely love Happy Brown House’s Washi Tape Mason Jar Lid Ornament. 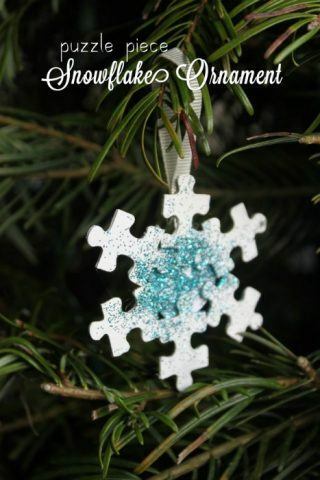 This traditional Puzzle Piece Snowflake Ornament from Mama.Papa.Bubba makes for a simple Christmas craft for the kids. 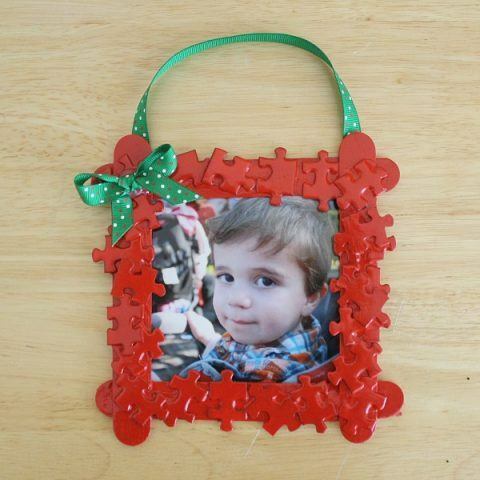 Buggy and Buddy uses the pieces to make a Puzzle Piece Frame Ornament for her kids’ pictures. Kids can make The Resourceful Mama’s Homemade Puzzle Pieces Wreath Ornament with those extra puzzle pieces. This small Puzzle Piece Reindeer Ornament from About Home is just adorable! Puzzle Candy Canes from That’s What Che Said are simple and festive. Happy Hooligans’ CD Snowman Ornaments would be great hanging on the tree or on the back porch. Glued to My Crafts uses old CDs as the base for large ornaments with her Recycled CD Ornaments. This Recycled CD Glittery Bird Ornament from School Time Snippets is glittery and just plain fun. Kids thread yarn through old CDs as the base of Cindy deRosier’s CD Yarn Wreath Ornament. Puffy Paint CD Ornaments from First Palette uses lots of fun puffy paint on old CDs. This Bottle Caps Holly Craft from Sugar Aunts would make pretty Christmas ornaments or an addition to Christmas wreaths. Sparkly Bottle Cap Ornaments from Life Over Cs add a lot of sparkle to the Christmas tree. 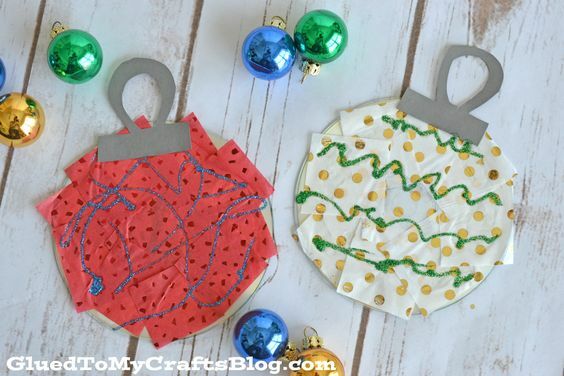 Homemade Bottlecap Ornaments from Teach Mama let the children get creative with making Christmas ornaments. Red Ted Art’s Bottle Cap Rudolph Ornament are so easy to make with the kids. 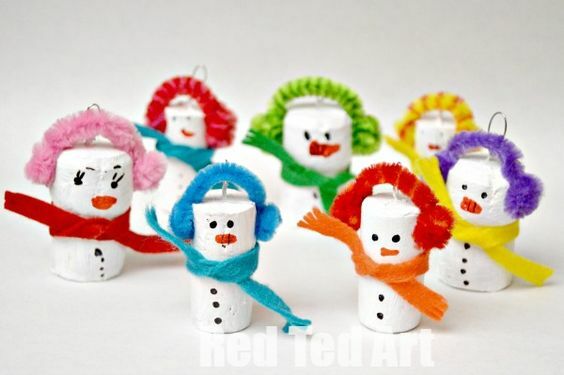 Make Red Ted Art’s Cork Snowman Ornaments with leftover corks. 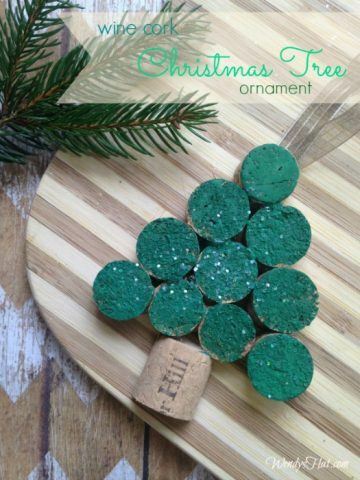 Cut up corks and use them to create the Cork Christmas Trees from Wendy’s Hat. This Cork Snowflake Ornament from Happy Mothering adds a rustic touch to Christmas decorations. Cork Gingerbread Man Ornament from Goodnyou? will surely make the kids smile as they craft. My Very Educated Mother’s Cork Candle Ornament is a simple and sweet Christmas ornament to make with the kids. These Mixed Media Christmas Ornament from Sunshine and Hurricanes are beautiful! Recycled Catalog Ornaments from The Outlaw Mom makes good use of all those catalogs you receive around the holidays. 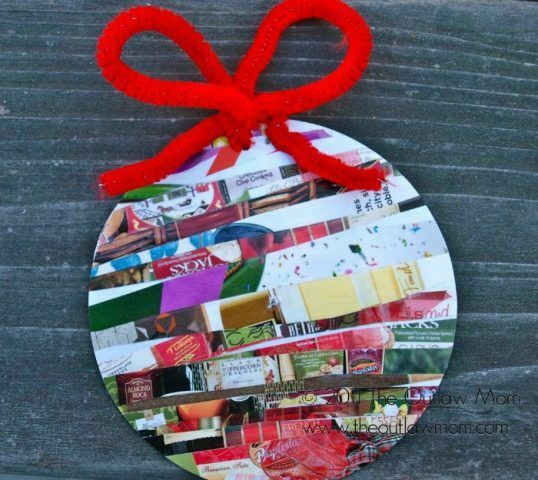 DIY Inspired’s Recycled Christmas Card Ornaments make Christmas decorations from old cards. Christmas Card Tree Ornaments from Petticoat Junktion are sweet and simple, and they’ll look great on the Christmas tree. 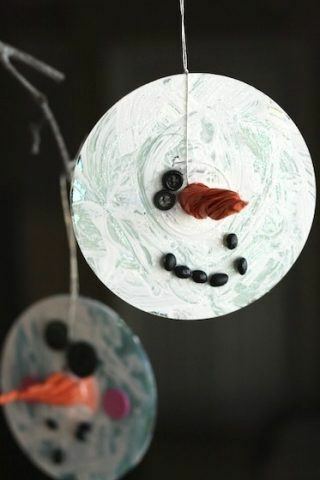 Buggy and Buddy’s Paper Mache Christmas Ornament is such a fun way to use recycled items while crafting for Christmas. 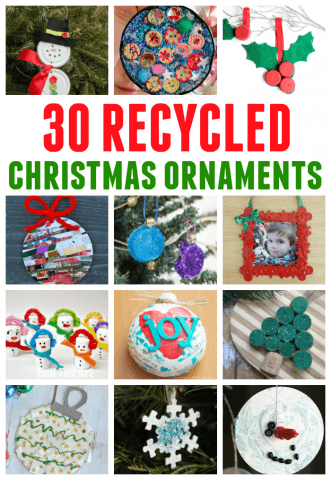 Which of these recycled Christmas ornaments would your kids like the most? So many great ideas, it’s just a matter of deciding which one to do first.